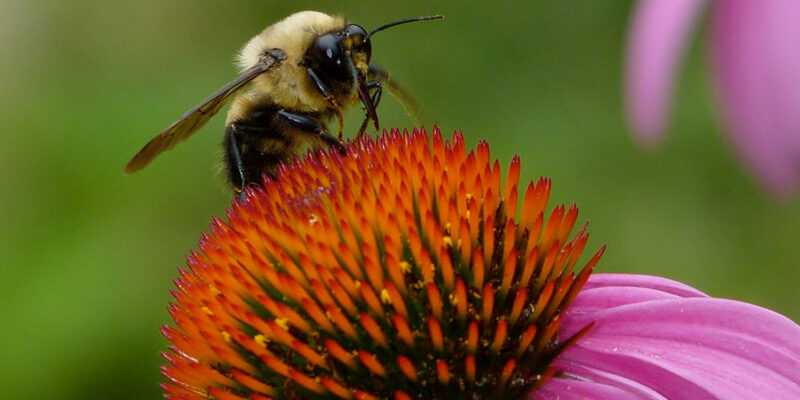 This bee and Echinacea flower (Figure 1) could not look more different, yet they are related, as are all living organisms on Earth. By following pathways of similarities and changes—both visible and genetic—scientists seek to map the evolutionary past of how life developed from single-celled organisms to the tremendous collection of creatures that have germinated, crawled, floated, swam, flown, and walked on this planet. Scientists use a tool called a phylogenetic tree to show the evolutionary pathways and connections among organisms. A phylogenetic tree is a diagram used to reflect evolutionary relationships among organisms or groups of organisms. Scientists consider phylogenetic trees to be a hypothesis of the evolutionary past since one cannot go back to confirm the proposed relationships. In other words, a “tree of life” can be constructed to illustrate when different organisms evolved and to show the relationships among different organisms (Figure 2). Figure 3. The root of a phylogenetic tree indicates that an ancestral lineage gave rise to all organisms on the tree. 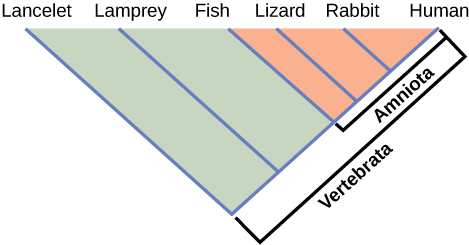 A branch point indicates where two lineages diverged. A lineage that evolved early and remains unbranched is a basal taxon. When two lineages stem from the same branch point, they are sister taxa. A branch with more than two lineages is a polytomy. In a rooted tree, the branching indicates evolutionary relationships (Figure 3). The point where a split occurs, called a branch point, represents where a single lineage evolved into a distinct new one. A lineage that evolved early from the root and remains unbranched is called basal taxon. When two lineages stem from the same branch point, they are called sister taxa. A branch with more than two lineages is called a polytomy and serves to illustrate where scientists have not definitively determined all of the relationships. It is important to note that although sister taxa and polytomy do share an ancestor, it does not mean that the groups of organisms split or evolved from each other. Organisms in two taxa may have split apart at a specific branch point, but neither taxa gave rise to the other. Figure 4. This ladder-like phylogenetic tree of vertebrates is rooted by an organism that lacked a vertebral column. At each branch point, organisms with different characters are placed in different groups based on the characteristics they share. It may be easy to assume that more closely related organisms look more alike, and while this is often the case, it is not always true. If two closely related lineages evolved under significantly varied surroundings or after the evolution of a major new adaptation, it is possible for the two groups to appear more different than other groups that are not as closely related. For example, the phylogenetic tree in Figure 4 shows that lizards and rabbits both have amniotic eggs, whereas frogs do not; yet lizards and frogs appear more similar than lizards and rabbits. Another aspect of phylogenetic trees is that, unless otherwise indicated, the branches do not account for length of time, only the evolutionary order. In other words, the length of a branch does not typically mean more time passed, nor does a short branch mean less time passed— unless specified on the diagram. 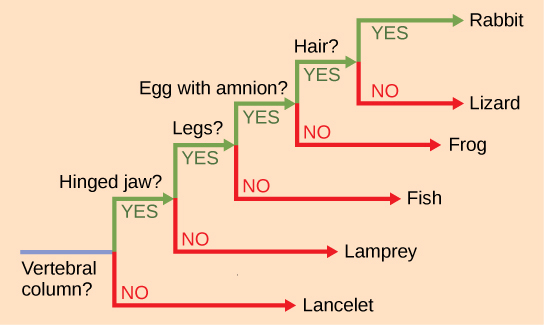 For example, in Figure 4, the tree does not indicate how much time passed between the evolution of amniotic eggs and hair. What the tree does show is the order in which things took place. Again using Figure 4, the tree shows that the oldest trait is the vertebral column, followed by hinged jaws, and so forth. Remember that any phylogenetic tree is a part of the greater whole, and like a real tree, it does not grow in only one direction after a new branch develops. 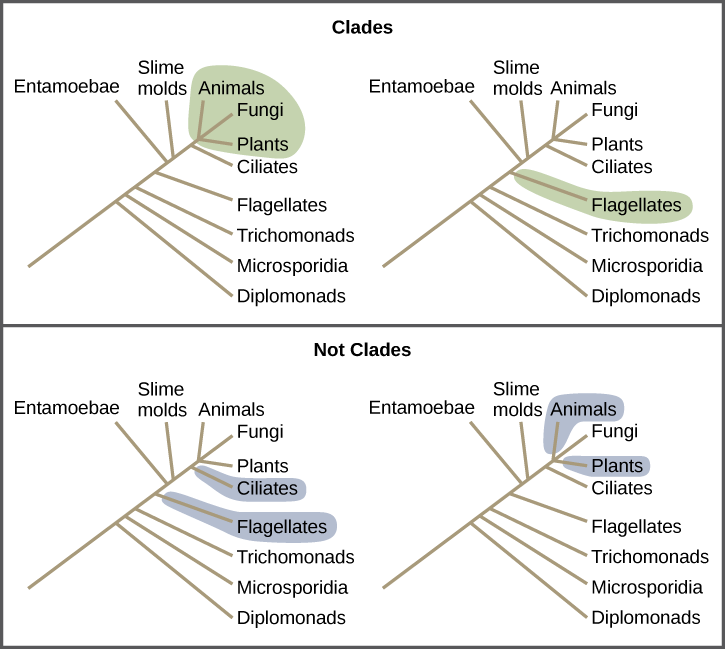 So, for the organisms in Figure 4, just because a vertebral column evolved does not mean that invertebrate evolution ceased, it only means that a new branch formed. Also, groups that are not closely related, but evolve under similar conditions, may appear more phenotypically similar to each other than to a close relative. The taxonomic classification system (also called the Linnaean system after its inventor, Carl Linnaeus, a Swedish botanist, zoologist, and physician) uses a hierarchical model. Moving from the point of origin, the groups become more specific, until one branch ends as a single species. For example, after the common beginning of all life, scientists divide organisms into three large categories called a domain: Bacteria, Archaea, and Eukarya. Within each domain is a second category called a kingdom. After kingdoms, the subsequent categories of increasing specificity are: phylum, class, order, family, genus, and species (Figure 5). The kingdom Animalia stems from the Eukarya domain. For the common dog, the classification levels would be as shown in Figure 5. Therefore, the full name of an organism technically has eight terms. For the dog, it is: Eukarya, Animalia, Chordata, Mammalia, Carnivora, Canidae, Canis, and lupus. Notice that each name is capitalized except for species, and the genus and species names are italicized. Scientists generally refer to an organism only by its genus and species, which is its two-word scientific name, in what is called binomial nomenclature. Therefore, the scientific name of the dog is Canis lupus. The name at each level is also called a taxon. In other words, dogs are in order Carnivora. Carnivora is the name of the taxon at the order level; Canidae is the taxon at the family level, and so forth. Organisms also have a common name that people typically use, in this case, dog. Note that the dog is additionally a subspecies: the “familiaris” in Canis lupus familiaris. Subspecies are members of the same species that are capable of mating and reproducing viable offspring, but they are considered separate subspecies due to geographic or behavioral isolation or other factors. Figure 6 shows how the levels move toward specificity with other organisms. Notice how the dog shares a domain with the widest diversity of organisms, including plants and butterflies. At each sublevel, the organisms become more similar because they are more closely related. Historically, scientists classified organisms using characteristics, but as DNA technology developed, more precise phylogenies have been determined. Cats and dogs are part of the same group at five levels: both are in the domain Eukarya, the kingdom Animalia, the phylum Chordata, the class Mammalia, and the order Carnivora. Scientists must collect accurate information that allows them to make evolutionary connections among organisms. Similar to detective work, scientists must use evidence to uncover the facts. In the case of phylogeny, evolutionary investigations focus on two types of evidence: morphologic (form and function) and genetic. In general, organisms that share similar physical features and genomes tend to be more closely related than those that do not. Such features that overlap both morphologically (in form) and genetically are referred to as homologous structures; they stem from developmental similarities that are based on evolution. 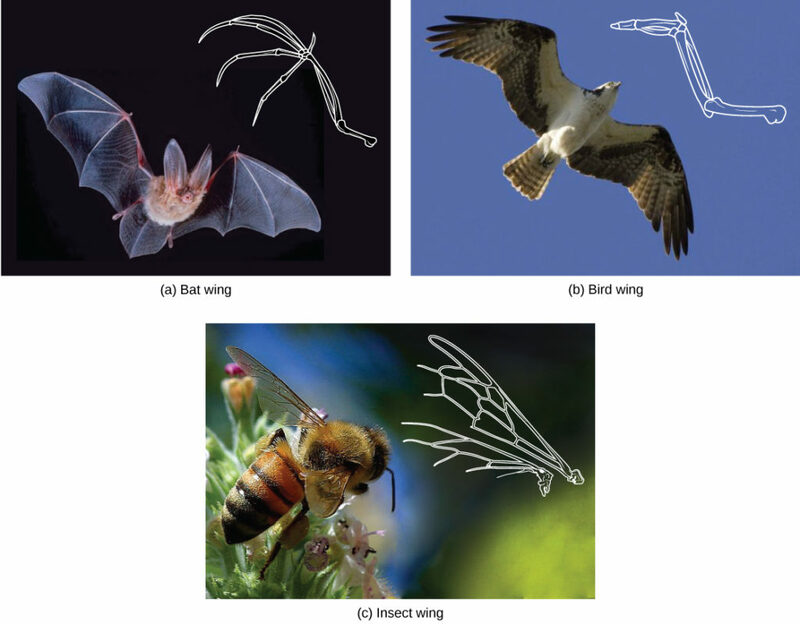 For example, the bones in the wings of bats and birds have homologous structures (Figure 7). Notice it is not simply a single bone, but rather a grouping of several bones arranged in a similar way. The more complex the feature, the more likely any kind of overlap is due to a common evolutionary past. Imagine two people from different countries both inventing a car with all the same parts and in exactly the same arrangement without any previous or shared knowledge. That outcome would be highly improbable. However, if two people both invented a hammer, it would be reasonable to conclude that both could have the original idea without the help of the other. The same relationship between complexity and shared evolutionary history is true for homologous structures in organisms. Some organisms may be very closely related, even though a minor genetic change caused a major morphological difference to make them look quite different. Similarly, unrelated organisms may be distantly related, but appear very much alike. This usually happens because both organisms were in common adaptations that evolved within similar environmental conditions. When similar characteristics occur because of environmental constraints and not due to a close evolutionary relationship, it is called an analogy or homoplasy. For example, insects use wings to fly like bats and birds, but the wing structure and embryonic origin is completely different. These are called analogous structures (Figure 8). Similar traits can be either homologous or analogous. Homologous structures share a similar embryonic origin; analogous organs have a similar function. For example, the bones in the front flipper of a whale are homologous to the bones in the human arm. These structures are not analogous. The wings of a butterfly and the wings of a bird are analogous but not homologous. Some structures are both analogous and homologous: the wings of a bird and the wings of a bat are both homologous and analogous. Scientists must determine which type of similarity a feature exhibits to decipher the phylogeny of the organisms being studied. With the advancement of DNA technology, the area of molecular systematics, which describes the use of information on the molecular level including DNA analysis, has blossomed. New computer programs not only confirm many earlier classified organisms, but also uncover previously made errors. As with physical characteristics, even the DNA sequence can be tricky to read in some cases. For some situations, two very closely related organisms can appear unrelated if a mutation occurred that caused a shift in the genetic code. An insertion or deletion mutation would move each nucleotide base over one place, causing two similar codes to appear unrelated. Sometimes two segments of DNA code in distantly related organisms randomly share a high percentage of bases in the same locations, causing these organisms to appear closely related when they are not. For both of these situations, computer technologies have been developed to help identify the actual relationships, and, ultimately, the coupled use of both morphologic and molecular information is more effective in determining phylogeny. How do scientists construct phylogenetic trees? After the homologous and analogous traits are sorted, scientists often organize the homologous traits using a system called cladistics. This system sorts organisms into clades: groups of organisms that descended from a single ancestor. For example, in Figure 9, all of the organisms in the orange region evolved from a single ancestor that had amniotic eggs. Consequently, all of these organisms also have amniotic eggs and make a single clade, also called a monophyletic group. Clades must include all of the descendants from a branch point. Figure 9. Lizards, rabbits, and humans all descend from a common ancestor that had an amniotic egg. 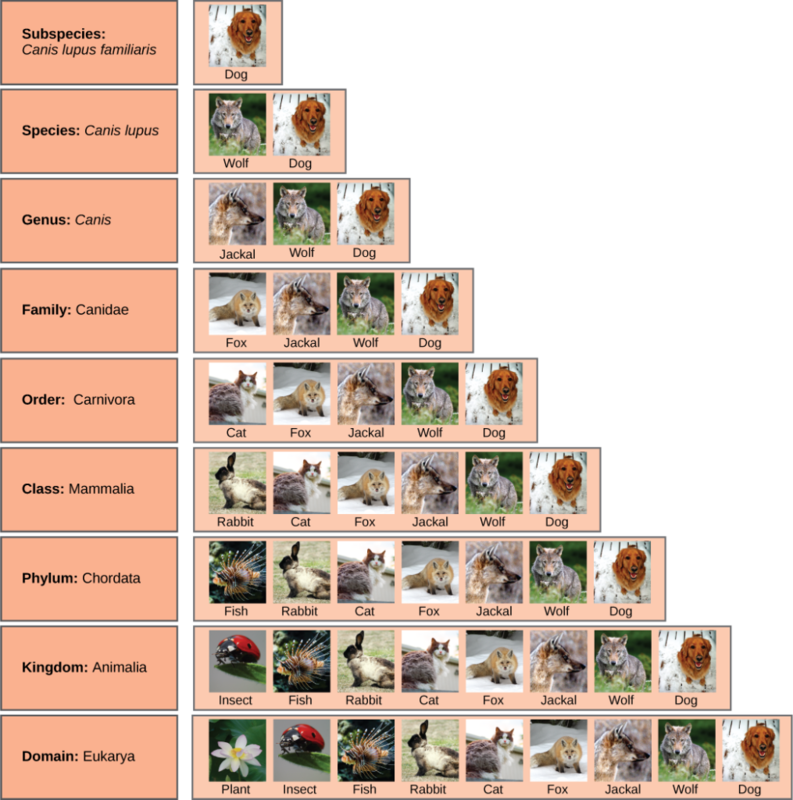 Thus, lizards, rabbits, and humans all belong to the clade Amniota. Vertebrata is a larger clade that also includes fish and lamprey. Rabbits and humans belong in the clade that includes animals with hair. The amniotic egg evolved before hair because the Amniota clade is larger than the clade that encompasses animals with hair. 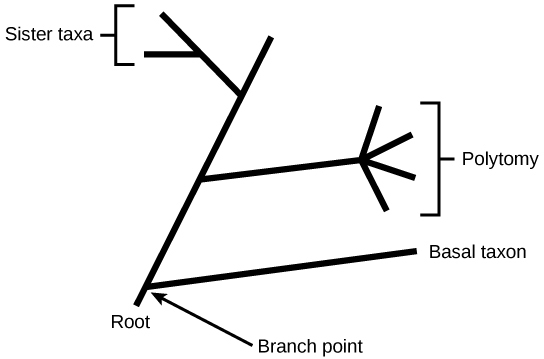 Clades can vary in size depending on which branch point is being referenced. The important factor is that all of the organisms in the clade or monophyletic group stem from a single point on the tree. This can be remembered because monophyletic breaks down into “mono,” meaning one, and “phyletic,” meaning evolutionary relationship. Figure 10 shows various examples of clades. Notice how each clade comes from a single point, whereas the non-clade groups show branches that do not share a single point. Figure 10. All the organisms within a clade stem from a single point on the tree. A clade may contain multiple groups, as in the case of animals, fungi and plants, or a single group, as in the case of flagellates. Groups that diverge at a different branch point, or that do not include all groups in a single branch point, are not considered clades. The largest clade encompasses the entire tree. If a characteristic is found in the ancestor of a group, it is considered a shared ancestral character because all of the organisms in the taxon or clade have that trait. The vertebrate in Figure 9 is a shared ancestral character. Now consider the amniotic egg characteristic in the same figure. 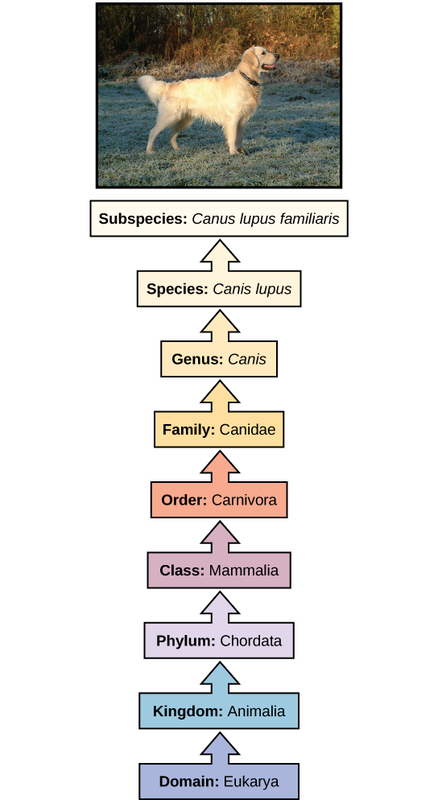 Only some of the organisms in Figure 9 have this trait, and to those that do, it is called a shared derived character because this trait derived at some point but does not include all of the ancestors in the tree. The tricky aspect to shared ancestral and shared derived characters is the fact that these terms are relative. The same trait can be considered one or the other depending on the particular diagram being used. Returning to Figure 9, note that the amniotic egg is a shared ancestral character for the Amniota clade, while having hair is a shared derived character for some organisms in this group. These terms help scientists distinguish between clades in the building of phylogenetic trees. Imagine being the person responsible for organizing all of the items in a department store properly—an overwhelming task. Organizing the evolutionary relationships of all life on Earth proves much more difficult: scientists must span enormous blocks of time and work with information from long-extinct organisms. Trying to decipher the proper connections, especially given the presence of homologies and analogies, makes the task of building an accurate tree of life extraordinarily difficult. Add to that the advancement of DNA technology, which now provides large quantities of genetic sequences to be used and analyzed. Taxonomy is a subjective discipline: many organisms have more than one connection to each other, so each taxonomist will decide the order of connections. To aid in the tremendous task of describing phylogenies accurately, scientists often use a concept called maximum parsimony, which means that events occurred in the simplest, most obvious way. For example, if a group of people entered a forest preserve to go hiking, based on the principle of maximum parsimony, one could predict that most of the people would hike on established trails rather than forge new ones. For scientists deciphering evolutionary pathways, the same idea is used: the pathway of evolution probably includes the fewest major events that coincide with the evidence at hand. Starting with all of the homologous traits in a group of organisms, scientists look for the most obvious and simple order of evolutionary events that led to the occurrence of those traits. Head to this website to learn how maximum parsimony is used to create phylogenetic trees. Many phylogenetic trees have been shown as models of the evolutionary relationship among species. Phylogenetic trees originated with Charles Darwin, who sketched the first phylogenetic tree in 1837 (Figure 11a), which served as a pattern for subsequent studies for more than a century. 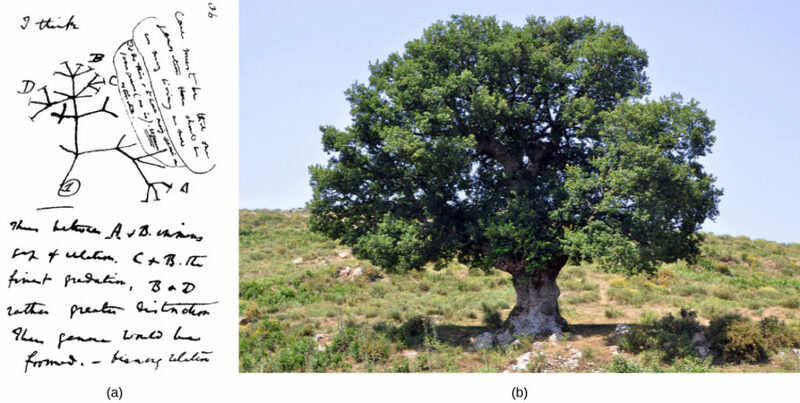 The concept of a phylogenetic tree with a single trunk representing a common ancestor, with the branches representing the divergence of species from this ancestor, fits well with the structure of many common trees, such as the oak (Figure 11b). However, evidence from modern DNA sequence analysis and newly developed computer algorithms has caused skepticism about the validity of the standard tree model in the scientific community. Horizontal gene transfer (HGT) is the introduction of genetic material from one species to another species by mechanisms other than the vertical transmission from parent(s) to offspring. These transfers allow even distantly related species to share genes, influencing their phenotypes. It is thought that HGT is more prevalent in prokaryotes, but that only about 2% of the prokaryotic genome may be transferred by this process. Some researchers believe such estimates are premature: the actual importance of HGT to evolutionary processes must be viewed as a work in progress. As the phenomenon is investigated more thoroughly, it may be revealed to be more common. Many scientists believe that HGT and mutation appear to be (especially in prokaryotes) a significant source of genetic variation, which is the raw material for the process of natural selection. These transfers may occur between any two species that share an intimate relationship (Table 1). In animals, a particularly interesting example of HGT occurs within the aphid species (Figure 12). Aphids are insects that vary in color based on carotenoid content. Carotenoids are pigments made by a variety of plants, fungi, and microbes, and they serve a variety of functions in animals, who obtain these chemicals from their food. Humans require carotenoids to synthesize vitamin A, and we obtain them by eating orange fruits and vegetables: carrots, apricots, mangoes, and sweet potatoes. On the other hand, aphids have acquired the ability to make the carotenoids on their own. According to DNA analysis, this ability is due to the transfer of fungal genes into the insect by HGT, presumably as the insect consumed fungi for food. A carotenoid enzyme called a desaturase is responsible for the red coloration seen in certain aphids, and it has been further shown that when this gene is inactivated by mutation, the aphids revert back to their more common green color (Figure 12). Within the past decade, the process of genome fusion by endosymbiosis has been proposed by James Lake of the UCLA/NASA Astrobiology Institute to be responsible for the evolution of the first eukaryotic cells (Figure 13a). Using DNA analysis and a new mathematical algorithm called conditioned reconstruction (CR), his laboratory proposed that eukaryotic cells developed from an endosymbiotic gene fusion between two species, one an Archaea and the other a Bacteria. As mentioned, some eukaryotic genes resemble those of Archaea, whereas others resemble those from Bacteria. An endosymbiotic fusion event, such as Lake has proposed, would clearly explain this observation. On the other hand, this work is new and the CR algorithm is relatively unsubstantiated, which causes many scientists to resist this hypothesis. More recent work by Lake (Figure 13b) proposes that gram-negative bacteria, which are unique within their domain in that they contain two lipid bilayer membranes, indeed resulted from an endosymbiotic fusion of archaeal and bacterial species. The double membrane would be a direct result of the endosymbiosis, with the endosymbiont picking up the second membrane from the host as it was internalized. This mechanism has also been used to explain the double membranes found in mitochondria and chloroplasts. Lake’s work is not without skepticism, and the ideas are still debated within the biological science community. In addition to Lake’s hypothesis, there are several other competing theories as to the origin of eukaryotes. How did the eukaryotic nucleus evolve? One theory is that the prokaryotic cells produced an additional membrane that surrounded the bacterial chromosome. Some bacteria have the DNA enclosed by two membranes; however, there is no evidence of a nucleolus or nuclear pores. Other proteobacteria also have membrane-bound chromosomes. If the eukaryotic nucleus evolved this way, we would expect one of the two types of prokaryotes to be more closely related to eukaryotes. Figure 13. The theory that mitochondria and chloroplasts are endosymbiotic in origin is now widely accepted. More controversial is the proposal that (a) the eukaryotic nucleus resulted from the fusion of archaeal and bacterial genomes, and that (b) Gram-negative bacteria, which have two membranes, resulted from the fusion of Archaea and Gram-positive bacteria, each of which has a single membrane. The nucleus-first hypothesis proposes that the nucleus evolved in prokaryotes first (Figure 14a), followed by a later fusion of the new eukaryote with bacteria that became mitochondria. The mitochondria-first hypothesis proposes that mitochondria were first established in a prokaryotic host (Figure 14b), which subsequently acquired a nucleus, by fusion or other mechanisms, to become the first eukaryotic cell. Most interestingly, the eukaryote-first hypothesis proposes that prokaryotes actually evolved from eukaryotes by losing genes and complexity (Figure 14c). All of these hypotheses are testable. Only time and more experimentation will determine which hypothesis is best supported by data. Figure 14. 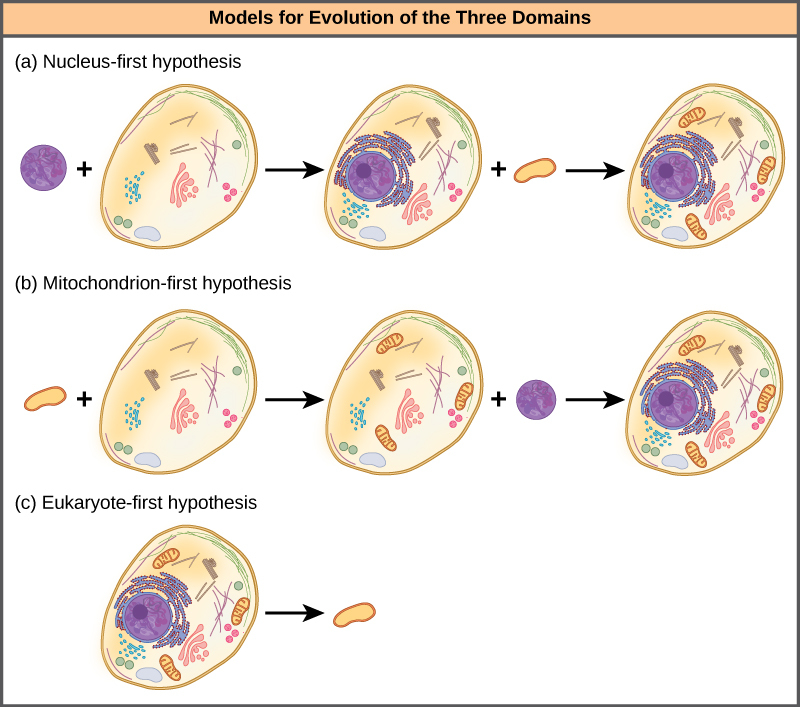 Three alternate hypotheses of eukaryotic and prokaryotic evolution are (a) the nucleus-first hypothesis, (b) the mitochondrion-first hypothesis, and (c) the eukaryote-first hypothesis. The recognition of the importance of HGT, especially in the evolution of prokaryotes, has caused some to propose abandoning the classic “tree of life” model. In 1999, W. Ford Doolittle proposed a phylogenetic model that resembles a web or a network more than a tree. The hypothesis is that eukaryotes evolved not from a single prokaryotic ancestor, but from a pool of many species that were sharing genes by HGT mechanisms. As shown in Figure 15a, some individual prokaryotes were responsible for transferring the bacteria that caused mitochondrial development to the new eukaryotes, whereas other species transferred the bacteria that gave rise to chloroplasts. 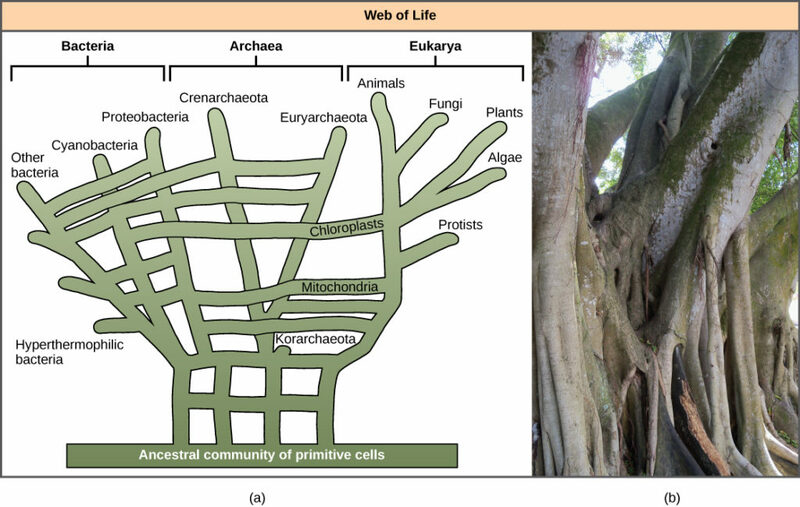 This model is often called the “web of life.” In an effort to save the tree analogy, some have proposed using the Ficus tree (Figure 15b) with its multiple trunks as a phylogenetic to represent a diminished evolutionary role for HGT. Figure 16. 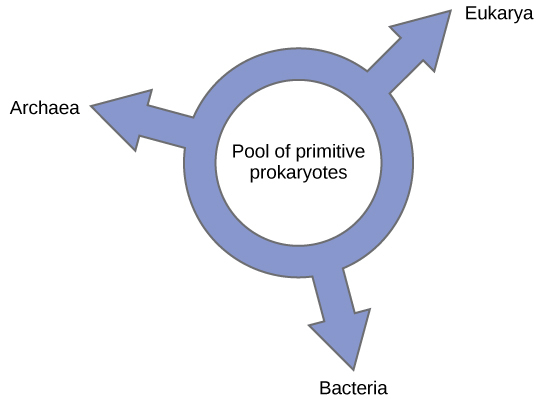 According to the “ring of life” phylogenetic model, the three domains of life evolved from a pool of primitive prokaryotes. Others have proposed abandoning any tree-like model of phylogeny in favor of a ring structure, the so-called “ring of life” (Figure 16); a phylogenetic model where all three domains of life evolved from a pool of primitive prokaryotes. Lake, again using the conditioned reconstruction algorithm, proposes a ring-like model in which species of all three domains—Archaea, Bacteria, and Eukarya—evolved from a single pool of gene-swapping prokaryotes. His laboratory proposes that this structure is the best fit for data from extensive DNA analyses performed in his laboratory, and that the ring model is the only one that adequately takes HGT and genomic fusion into account. However, other phylogeneticists remain highly skeptical of this model.